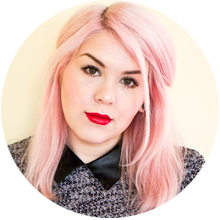 Sparkly Vodka is a UK based beauty & fashion blog run by Caroline Henson. Hello! I'm Caroline, a 27 year old graphic designer from London. I made the move up north to Leeds for university 7 years ago and never went back! I now live in Huddersfield with my 5 year old daughter. Sparkly Vodka started as something fun to do whilst my daughter napped. It's a place where I can share products I love to use, the clothes I like to wear and anything else I'm enjoying at that moment in time. Sparkly Vodka was nominated for best established beauty blog at the Cosmopolitan Blog Awards 2011. It was also featured in the August 2012 edition of Company magazine. 1. What camera do you use? I currently use a Canon 650D with a 18-135mm STM lens or a 40mm STM pancake lens. Before September 2012 I used a Canon 400D. You can read all about my current blog photography setup here. 2. How do you afford all these things considering you're a full time mum? I work part-time from home as a freelance graphic designer. I also rely on my credit card a lot. I don't actually buy a lot of stuff compared to most people as I prefer to purchase quality over quantity. Sometimes I am lucky enough to be sent things for free from certain brands. 3. Who designed your layout & can you help me with mine? I designed this layout myself as I am a graphic designer. I've been making websites since I was about 12 years old so I'm happy to help out anyone who might be struggling with CSS or HTML. If you want me to design a layout for you feel free to email me. 4. How tall are you & what size are you? I am 5ft 4in and am a size 10-12. 5. How did you lose weight? I used to weigh 13 stone and was a size 18. I only managed to lose weight once I started university. I pretty much ate whatever I wanted and always had either a custard danish or a chocolate bar with my lunch. I did however walk absolutely everywhere and went to the gym twice a week. 6. What skintype do you have? I have combination skin with an oily t-zone & dryer cheeks. It is prone to blemishes and slightly dehydrated. 7. Do you dye your own hair? No. My hair is naturally very dark as evidenced by my roots & eyebrows. My hair has always had some form of dye in it since I was 9 years old. I've had some home hair dye disasters in the past so I always get my bleach done at a salon. When I lived in London I used to get my hair done at Taylor Taylor. I now get it done at Cutting Room Creative in Leeds. 8. How did you dye your hair pink? I mixed some Directions Carnation Pink dye with white conditioner and covered my hair in it for about 20 minutes before washing it off. To keep the colour vibrant I made up some of the dye and conditioner mix and put it in a plastic bottle. I used this everytime I washed my hair and just used it like normal conditioner. More recently I have used Bleach London's Rose Shampoo & Conditioner.